So the journey begins--architectural intern seeks to learn the philosphy and craft of natural building. I'm 'stepping off the treadmill' and excited for the next phase of my life, meeting new people, learning new ways of building, and discovering the positive forces which our endangered world still holds strong. My first stop is the Cob Cottage Company in Coquille, Oregon where I participated in a nine day workshop with twenty other like-minded individuals. 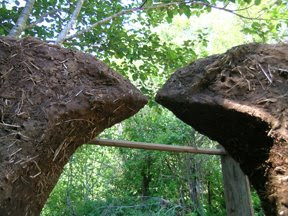 Simply an amazing experience, each morning began with slient cob mixing, usually three or four batches before breakfast. 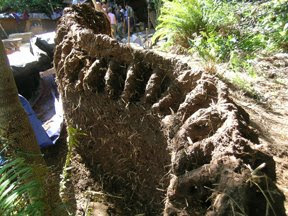 (We combined 2-buckets of clay rich soil, 1-bucket of sand, a few flakes of straw, and some water...how much? 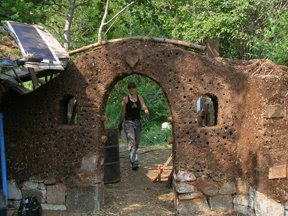 well, it depends...) At the cob cottage company the soil is ideal--'dream cob', becoming smooth yet sticky with little effort. The rest of each day was filled with productive work sessions and question-style lectures. It's amazing how many answers you already know. 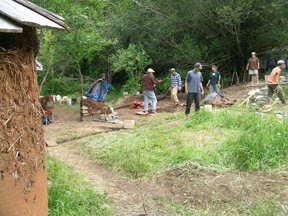 Before you knew it we had a foundation done, and walls growing steadily by the hour. In between building sessions, we were served the most delicious natural food, consisting mostly of garden greens and veggies, beans, and fresh earth-oven baked bread. I especially loved Eva's carob cob balls for dessert. So healthy! What more could you ask for? 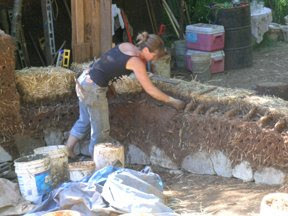 By the end of the week, we had built 40 linear feet of the curved garden wall, the first two courses of a bale-cob bath house and an impressive arch connecting the new bathhouse to the existing solar shower. On the last two days, we even roofed the garden wall! 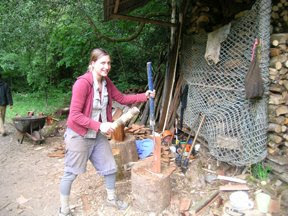 We did so by going into the woods, harvesting cedar bolts, splitting our own shakes and installing them directly onto the walls. Our accomplishments amazed us all. I could go on and on about the things we built and leanred, so if you want anymore information about the building technique, please feel free to comment or ask me. The time passed quickly as my comfort level with the material and construction technique became second nature. Indeed, we learned a lot about building, but what I wasn't expecting was what we learned about living. When you live in a way that is connected with nature, everything falls into place, there is a lot less to worry about, and you start feel safe about the fate of our world. In the short time I was there, my 'doomsday' sentiments about the current state of a lot of things turned to a much more faithful tune. What a great way to begin this mud-hugging adventure. In short, your world is what you make it, so let's get digging.